This holiday, put away the pots and pans and skip the trip to the grocery store altogether. Let Sacramento’s Best Taco Catering company handle all of your holiday catering needs for your office parties, family get-togethers, and corporate events. Let us handle all the cooking while you enjoy your holiday fiesta – and the compliments you’ll get on the cooking! Whether you’re planning a holiday party to entertain family and friends at home, or planning a holiday party for your office, or maybe even need holiday catering for someone else, we can help you turn your holiday party into a memorable, festive and joyous occasion. ALL YOU CAN EAT TACOS FOR CHRISTMAS? THANK YOU SANTA! With our All-You-Can-Eat Taco Bar, you’ll be the hit of the season. Why limit your guests to sandwiches or even worse, the dreaded pot-luck? 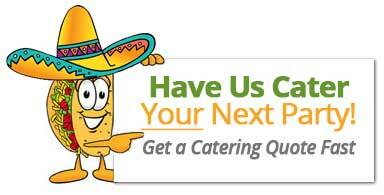 With Sacramento’s Best Taco catering, you get the best of both worlds. Authentic home cooked Mexican Street Tacos, with your choice of meats and sides. Let us put together the perfect holiday catering menu for you and your guests. Place Your Tamale Order Today – A Holiday Favorite! Did we forget to mention that we prepare tamales fresh to order? Enjoy a popular mexican holiday dish prepared with traditional Jalisco flavors and ingredients by our very own head chef Trini.